Apple announced new MacBooks, a new MacBook Air, and of course, the Apple Watch. What made headlines is that the most expensive version of the watch costs—are you ready for this?—$10,000 (and up!!). Ridiculous, if you ask me (which of course you didn’t). The tech news was all over Apple’s big day like white on rice so I’ll leave the summary to them. Check out this good and quick read: 9 Biggest Things for the Apple Watch and MacBook Announcement. 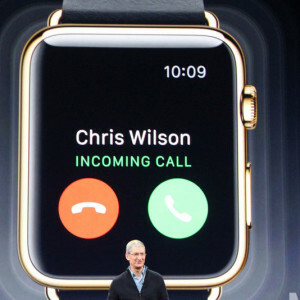 For just Apple Watch details, check out this MacWorld piece. And, if you’ d like a laugh today, read Mashable’s list of things you can buy for $10,000 besides the gold Apple Watch. Upsilon Circuit is game unlike you’ve ever really played – other than the game of real life, that is. Why? Because when you die in the game, you can never play again. Ever. Not even under a new account name nor as a new character. Business Insider has a good summary of how the game is played, but here’s an ever shorter one: only eight players at any time can be on the game and everyone is competing against each other and enemies. You can watch the game via life stream and, when one person “dies” someone from the audience is selected to join in. No pricing or details yet on when this is going to hit the market, but it’s an interesting idea! If you’re heading to the Smithsonian, New York’s Museum of Modern Art, the Met, the DC National Gallery, or the Getty Center, be prepared to take old-fashioned arm-length selfies. Major museums around the world are banning selfie sticks out of fear they’ll cause damage to art. Also, they’re just annoying :-). The new Chromebook Pixel is out and reviewers are putting it through its paces (I’m nothing if not fair and balanced in my Android/iPhone news coverage). The consensus is: it’s nice…but who needs it? The Verge isn’t sure who it’s for, although they like it. Engadget says it’s expensive and found it a bit impractical for the $999 price tag (you can buy something cheaper or the same price that does more). USA Today is more positive saying it’s really a nice machine and they do not dwell on its limitations. The Geneva International Auto show featured more than just cars—Goodyear introduced a concept tire (yeah, I didn’t know they existed either). The idea is that the material absorbs heat from the sun, friction, and as the tire flexes and turns it into electrical energy. If nothing else, they sure look cool and high-techy. TechCrunch reported this week that Amazon just bought up a company called 2lementary. It’s a startup that has developed a platform for tracking and managing IP-enabled machines and other connected devices. Translation: What 2lementary does will help Amazon develop devices that can talk to each other. It’ll be interesting to see what unfolds, but I think it’s safe to assume we’ll be hearing about more connected devices soon! The name of the aircraft is the Solar Impulse-2 and it’s trying to make it around the world on nothing but power from the sun. It’s a single-seat craft (without heat or pressurization!) and over the next five months it will travel around the globe…with a few stops so the two pilots (who are splitting the duty) can rest and to perform maintenance on the vehicle. You can follow the path of the plane here.